"For some people, participating for an hour at a vigil is a daunting task... While it may be a challenge, it can be a wonder-filled, grace-filled blessing." To be on a vigil is to be wakeful for a purpose. To the ancient Romans, that could be to stand guard, spy on the activities of a possible enemy, or prepare for a holy occasion. Originally, the desire to take part in the holy occasion is so strong that you can't wait for it to happen, which means you're so full of determination that waiting and getting ready is all you can do, to the neglect of sleep or food. You don't want to miss a second of it, you want to be there even for the preludes or the first sunbeams. 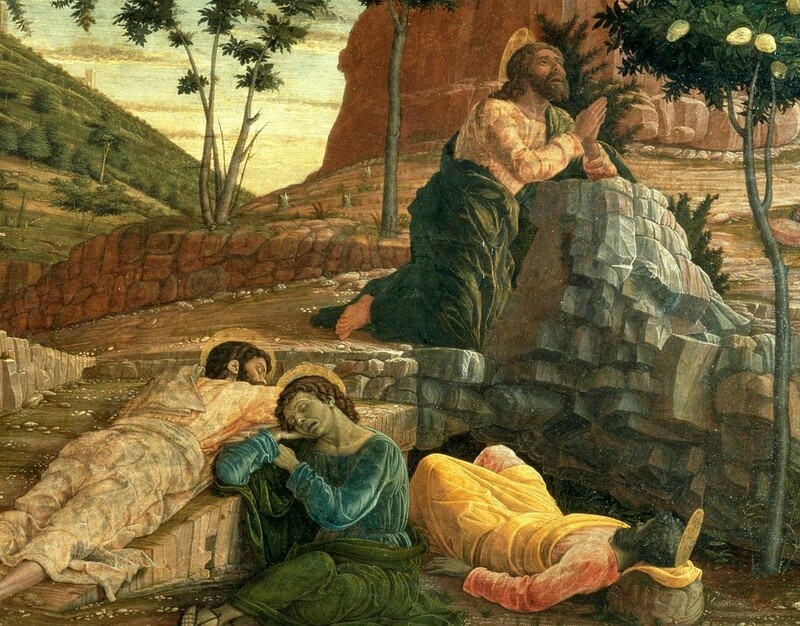 Many congregations, following their Maundy Thursday liturgy (Agapé meal, washing of feet, and/or stripping of the altar) hold a vigil, a watch until the start of the Great Vigil of Easter late on Holy Saturday. This can occur at the church or in people's homes. Whatever vehicle is chosen to focus our prayer, the Gethsemane watch presents us with a superb opportunity to teach faithfulness in prayer and discipleship. "Could you not keep awake one hour?" were the words of Jesus in reproach to his hapless followers in the first Gethsemane. Ever since, his disciples of subsequent generations have attempted to do better, and in some small way to make up what was lacking in the first bunch. It is helpful to teach the importance of this time well before the event, and to display on previous Sundays a rota of prayer times for people to sign up for an hour or two. It is a time of no talking, with the lights of the church interior dimmed to a level equivalent to emergency lighting, sufficient only for safe exit. Many churches erect an 'altar of repose,' which is a table set up in a separate place at some distance from the main sanctuary or where the Maundy Thursday sacred meal has just been celebrated. The movement from one place of worship to another recaptures a sense of the journey by the disciples from the upper room to the place called Gethesemane. Local circumstances will determine where this place apart is best located, and it is good to be creative. Sometimes a side chapel in a large church building with suffice, or perhaps the far end of the building precisely because it is a portion of the church building rarely used at any other time of the year. Going further, it may well make more of a statement if your own Gethsemane is less convenient and more exposed. It might be located in a narthex, porch, gallery or the church hall. Weather permitting, it might even be outside in a courtyard or garden. It is helpful to transform this space into a garden - a minimalist garden of what vacant lot in a Middle East city may look like in winter. Easter has not yet arrived, so it should not look like the Botanical Gardens or a Flower Show. Branches, not blossoms, set the tone. A simple table forms the centerpiece of the 'garden,' on which a cloth (corporal) is spread, with enough candles on either side to produce light with simplicity. On the cloth are placed the 'reserved sacrament' to be used at the Good Friday service, if communion will be offered. The 'garden' should remain predominantly open, with just enough furniture to allow different options for private prayer - a few stools or upright chairs, some cushions on the floor, a bench or two at the perimeter. If you wish to have a prayer watch throughout the hours from the end of the Maundy Thursday service through the first service of Easter done by individuals in their own locations, organize the same type of sign up process. Provide a portion of scripture or prayers for them to read during that time in their home or wherever they may be at that time of day or night. Reading portions of the Psalms or any of the Gospels of the readings for Holy Week can be provided. For some people, participating for an hour at a vigil is a daunting task. An hour can seem like a long time to spend in prayer. Those who volunteer can receive a packet of prayer "helps" - suggestions for prayers, prayer requests and scripture to inspire prayer. (Make sure there are bibles available!) It isn't meant to be easy or routine. It is a time to be in conversation with God. While it may be a challenge, it can be a wonder-filled, grace-filled blessing. A portion of this article is adapted from "Times and Seasons: Creating Transformative Worship Throughout the Year" by Richard Giles (Church Publishing, 2008).